We carry a large selection of American made USA Flags in many sizes. We stock USA flags in Cotton, Nylon and All-Weather 2-Ply polyester flags. Our prices are hard to beat! We also carry Genuine G-Spec USA flags. These G-Spec (TM)Government Specified USA flags are identical to those the US government has specified and are made in accordance with U.S. Code, Title 4. Available in Cotton, or Nylon fabric. 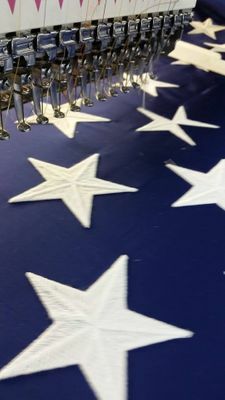 We Now carry USA Bemberg Rayon Embroidered flags. These flags are the most luxurious and visually stunning flags available for display. These are made to official Government specifications and are in use by our Armed forces to display along their ceremonial and Departmental flags. U.S.A. Bemberg Rayon Embroidered Flag (No Fringe) 4'4"x5'6"